July 16, 2013 – Huntington Station, NY - The heat is on and there’s no better way to stay cool and comfortable than with a nice dip in the swimming pool. Before school was out and the temperature started rising, Suffolk Legislator Lou D’Amaro (D-Huntington Station) met with students at John F. Kennedy Intermediate School in Deer Park and both DeLuca and Parliament Place Elementary Schools in North Babylon to discuss pool safety tips and honor those who participated in Suffolk County’s 2013 “Be Pool Smart” poster contest. Established in 2007, the annual competition invites elementary school students to promote the importance of pool safety and prevent accidental drowning by creating a poster that illustrates one or more safety tips. The students also shared some of their personal experiences and own safety tips with Legislator D’Amaro. 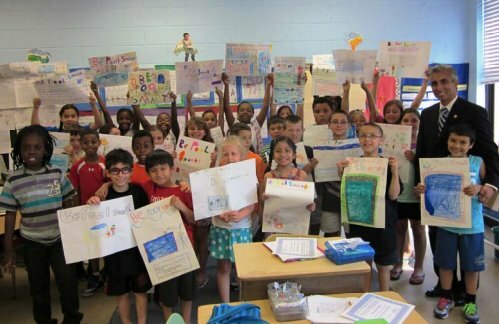 In the “Be Pool Smart” poster contest, one entry is selected from all of those submitted Countywide to be used as a part of a seasonal safety campaign from the Suffolk County Department of Health Services. Students from schools in South Huntington, Half Hollow Hills, Deer Park and North Babylon School Districts were invited to participate in this year’s District 17 preliminary competition. Each participant received a Certificate of Distinguished Achievement. The local winner, Juliana Gentile of Deer Park, was named the All Suffolk Winner and her drawing will appear on the cover of future Suffolk County “Be Pool Smart” brochures. Subject: LongIsland.com - Your Name sent you Article details of "The Heat is On! Legislator D’Amaro Reminds Everyone To ‘Be Pool Smart’ This Summer"